Though Oahu is the most populated of the Hawaiian Islands, it can be surprising to learn that there are only four major beach hotel resort areas. There are some hotels near the airport and accommodations dotted throughout the island, but for a beach vacation, you’ll mainly need to choose from the four major resort hotels. The following image indicates those major Oahu resort areas. Waikiki Beach – dozens of hotels ranging from basic economy to mid-range to luxury accommodations. You don’t necessarily need a rental car if you stay in Waikiki Beach as you can use shuttles, taxis and public transportation. There’s great shopping and many restaurants within walking distance. We share a bit more about Waikiki Beach in the below notes. Kahala Resort on southeast Oahu – offers oceanfront luxury in the Kahala community of Honolulu. The Kahala Resort is the only hotel in the area. They have their own restaurants, Dolphin Quest and an adjacent golf course. They offer a shuttle service into Waikiki, which is less than 15 minutes away, for more dining and shopping options. Turtle Bay Resort on the North Shore is the area’s only beachfront hotel and condo community. 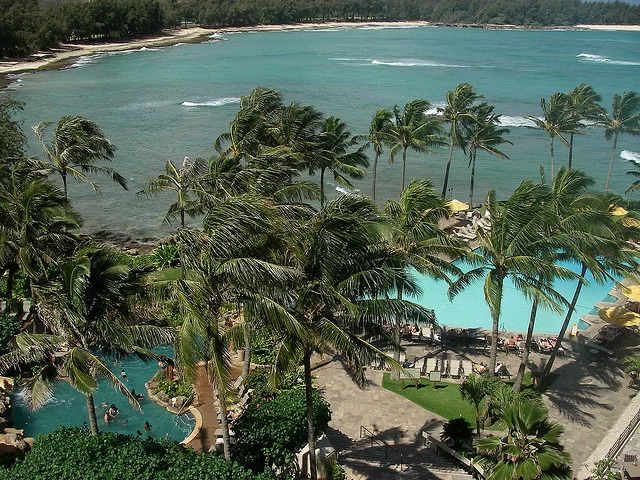 Turtle Bay Resort is an oceanfront four-star resort built on a peninsula that’s flanked by two beaches. Most of their rooms offer at least an ocean view. Room rates tend to be fairly reasonable for the level of room and views that they offer. The North Shore is our top pick on Oahu for a relaxing vacation. It’s more peaceful than other areas of Oahu, yet it is accessible/drivable to many great sightseeing spots on the island. The resort offers horseback riding, golf and many more activities. Turtle Bay Resort has several good restaurants onsite. Outside of the resort, there aren’t too many nearby restaurants, with the exception of the North Shore’s famous shrimp trucks, which are only about a 5 minute drive away. A scenic 20-minute drive to the iconic North Shore town of Haleiwa provides many other eateries. Ko Olina is located in the southwest “corner” of Oahu. The Ko’olina resort community has a mix of condos and hotels. Ko Olina offers the second most number of hotels outside of Waikiki. The new Disney resort, Aulani has been very popular. There’s a newly opened Four Seasons Oahu, which was formerly the JW Marriott Ihilani. There’s also a Marriott Vacation (timeshare) resort here plus vacation condos. The manmade lagoons at Ko Olina offer a relatively sheltered area for kids to swim and play. Area activities include golf, tennis, spas and more. We like Ko Olina, but one of the very slight downsides is that we feel that we have to drive further to get to some of the best sightseeing spots on the north and east shores of Oahu. In addition to hotels, you can also find vacation rentals and bed and breakfast accommodations around the island. For solo travelers on a budget, you can find hostels on Oahu, too. By far the most popular area to stay on Oahu is Waikiki Beach in Honolulu. This area hosts Hawaii’s most iconic beach, hotels to match any budget, excellent shopping, gourmet and casual dining and most any water sport your heart desires. The urban vibe blends with the aloha spirit which perpetuates the popularity. Waikiki Beach suits vacationers looking for an energetic environment where there’s a bit of nightlife. Waikiki Beach can be crowded at times. (See what our readers think of Waikiki Beach.) On the other hand, if you are looking for a quiet, calm environment for your Oahu vacation, we recommend that you stay on the North Shore, Ko Olina or Kahala resort areas. Since Waikiki offers a huge selection of hotels to suit any budget, let’s look at it a bit closer. As you might expect, ocean front resorts tend to be more expensive while hotels a couple of blocks away from the beach are much more budget-friendly. I should also mention that New Otani Kaimana Beach Hotel is oceanfront, though please note that this hotel is beach front, but not in the heart of Waikiki’s shops and restaurants. It’s close to Diamond Head. Want to stay where there’s a great pool in Waikiki? See our list of the Waikiki hotels with the best pools. Traveling with a family? See our recommendations for the best family hotels in Hawaii. For more Oahu accommodation insights and reviews, see this TripAdvisor link. There’s also several youth hostels in Waikiki. They’re really inexpensive and a great way to meet backpackers from all over the world! We (2 couples) are planning a 22 day trip to Hawaii and hope to visit four islands, Oahu, Kauai, Maui and Hawaii (The Big Island). We will arrive and depart from Honolulu and planned to spend the first 5-6 days on Oahu. Do you have any suggestions as to the order we visit the other islands? We do want to bike Haleakala on Maui, so would that be a good second choice???? Any ideas you have would be greatly appreciated. We are mostly interested in hiking, snorkeling, seeing great sites, and relaxing. I have learned so much from all the information you have on this website…THANKS!!! It’s been so much fun planning. There’s not really a particular sequence to follow when visiting the Hawaiian Islands. To minimize connection times between islands, consider that there are more direct flights to Kauai and the Big Island out of either Oahu or Maui. We are thinking of getting a hire for 7 days while we are staying on Oahu but the hotel will charge us $29.95 per we are staying at the Hilton Waikiki Beach is there a parking garage in the area we may be able to use??? I have been researching non stop for our first trip to Hawaii. Right now I am focusing on Oahu. No matter what I am reading about there are comments/tips about not leaving items in your car, or unattended on the beach, or comments about hotels being “safe”. Is there that much crime there? Do you have to be careful when walking around, especially at night? Are visitors targeted? We travel a lot to Hawaii and beyond. In our opinion, Hawaii is very safe. Just like any tourist destination around the world, you need to be careful to not leave valuables unattended. I will be spending a week in Waikiki next year, for the most part by myself. Can you tell me how safe it is for a solo female traveller in Hawaii? Thanks! I don’t have any data to point to, but several years ago Forbes put out a ranking of the safest cities and Honolulu was on the list. My friend Gray who writes Solo Friendly has taken a couple of solo trips to Waikiki. She didn’t have any issues. You don’t list Park Shore Waikiki as a hotel across the street from the beach. Do you have any information about this hotel? We haven’t stayed there. So, we don’t have any detailed information on it. Check TripAdvisor for reviews. I’m planning a first trip to Oahu next year. Where would you suggest as an inexpensive hotel with the closest tourists attractions such as snorkeling and dolphin watching? The most inexpensive hotels are in Waikiki Beach. 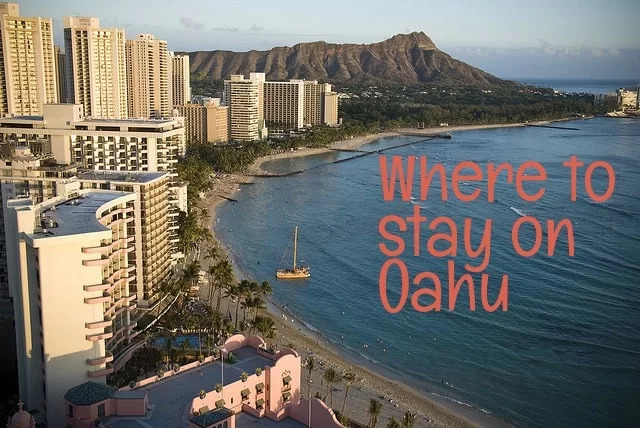 Oahu is big and has some traffic issues, but for the most part, you can get to all the major attractions from anywhere you stay. Hi Sheila – I’m planning my first trip to Oahu in September. Can you tell me where to go for the best Laui experience? Thank you! Used your site to plan our little vacation. just wanted to add that we stayed that the hyatt place in waikiki beach and it was VERY affordable and it really was lovely. Great to hear Billy, thanks! We are deciding whether to stay in Ewa beach or near Whitmore village. And we plan to spend 6 days in Oahu and visit all the famous travel places in Oahu. what ‘s your recommendation. Also, we don’t have a car. Is it feasible to visit Turtle Bay and PCC in one day.? There’s also the Hyatt Place Waikiki Beach with excellent ocean views! Have fun in Hawaii! Just booked our trip to Turtle Bay in August! So excited as it’s our 10 year anniversary and we met in Waikiki beach 18 years ago. I’m hoping to have a nice, relaxing vacation with good weather. My only concern is the wind as I know the north shore can be quite windy. Have you been there in late August? If so, was the wind tolerable? Thank you and so glad I came across your site! I believe the wind tends to be stronger in winter months with the high surf. Just bear in mind that weather can be unpredictable.